Ballen and Sanguinetti are two photographers who work well with living animals - Sanguinetti also touches on animal mortality - and dead animals are as much a mark of art photography as the living and the stuffed. Clive Landen did a whole book on dead animals. Titled Familiar British Wildlife, it features the roadkill Landen encountered around his home in the Forest of Dean. Trent Parke did a series of pictures on Australian roadkill, the star of the Wonderland series of documentaries was The Man who eats Badgers and come to think of it, I see dead badgers almost every day, but I've never seen a live one. Never. 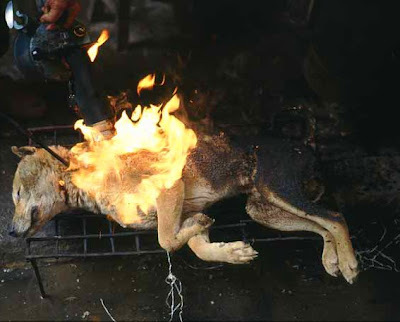 The dead dog above is from a market in China. Congo - Editors are "as guilty as the warlords"